by Bob Whitesel Ph.D., 10/23/17. When a student is in graduate school, they are expected to “think at a higher level” than they would while pursuing an undergraduate degree. But how do you define this higher level of thinking? Thankfully, an educator named Benjamin S. Bloom and his colleagues devised a hierarchal way of looking at learning. 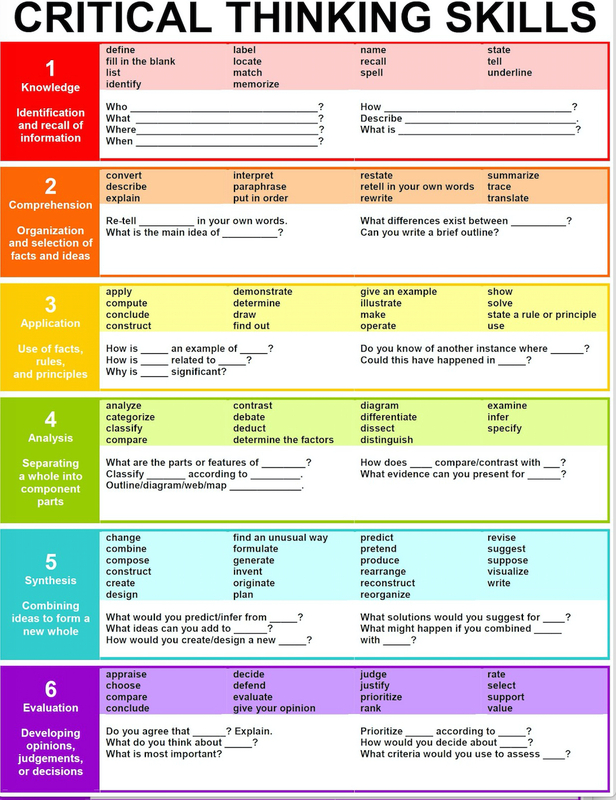 They gave the “higher levels of thinking, higher numbers” in a chart called “Bloom’s Taxonomy” It can be found in the book: Taxonomy of Educational Objectives: The Classification of Educational Goals (1969). So, we as professors are trying to encourage students to think at higher levels as charted on Bloom’s chart of learning. To see the difference, look at the words associated with the higher domains, such as “analyzing (level 4), evaluating (level 5) and creating (level 6).” I think you can see that you can’t be analyzing without comparing 2+ views on the topic. And you certainly can’t be evaluating or creating without looking at 2+ views on each topic. Therefore as a professor, I give my students a rule-of-thumb in my syllabi that “analyzing, evaluating and creating” in my courses requires a rule-of-thumb use of 1-2 textbooks and 2-3 outside sources for average, i.e. “B-level” work. Therefore a student who scores better than a B would be expected to use 3+ textbooks and 4+ outside sources. Students had told me this rule of thumb greatly helps. So dig into other views on each topic you’re studying by skimming articles, books and videos on each topic. To help you do this, I created ChurchHealth.wiki as a great place to find those articles. You can just “search” for a topic and you will find hand-picked articles I have curated for you because they are relevant to the topics I teach. Have students stand in a straight line (quite close together). Request they hold hands with the person on either side of them for as long as possible and refrain from speaking during the exercise. Or they can stand in a circle without holding hands. Questions: What are your thoughts and feelings about this exercise? Were you surprised? Why? If time permits or if relevant: Would your placement have been different if the exercise included questions about disability or religion? How could affirmative action impact these issues? Take about 10 minutes for the pairs to process and then have them report back to the group as a whole. CONVERSION & How and When Does Conversion Occur? by Bob Whitesel D.Min, Ph.D., excerpted from Spiritual Waypoints: Helping Others Navigate the Journey (2010), pp. 138-139. Does conversion occur in a flash, with miraculous transformations and heavenly encounters? Does conversion take place over time? Or perhaps conversion is a stumbling process, where the conversionary experience takes place in what Richard Peace calls “fits and starts.”[i] Richard Peace, Scot McKnight and others have looked at the New Testament record and conclude that the answer is “all of the above.”[ii] Let us look at three basic categories. Sudden Conversion. Sometimes conversion takes place “in a flash … a sudden point-in-time transformation based on an encounter with Jesus.”[iii] This is the experience of Saul/Paul in Acts 9, and has became the standard way the evangelical church looks at conversion. [iv] At the altar sudden and dramatic responses are often expected, door-to-door visits lead to a “prayer of commitment,” and mass rallies end with an appeal to come forward for conversion. [v] While this may be required to facilitate a person on the verge of a sudden conversionary experience, not all conversions happen in this manner. Psychologist Lewis Rambo, in an exhaustive look at religious conversion, concludes that “for the most part it (religious conversion) takes place over a period of time.”[vi] Thus, the evangelical church may be limiting the number of wayfarers she can help by focusing too exclusively on sudden conversion. Scot McKnight describes how progressive conversion can take place in churches that practice infant baptism. McKnight states, “for many Christians conversion is a process of socialization,”[x] meaning that nurture is confirmed later by personal affirmation. For example, an infant baptism or an infant dedication can be seen as a public affirmation that the church community and parents will nurture that child (i.e. via spiritual socialization). After growing up in this environment of spiritual socialization and religious community, the grown child will be expected to ratify this effort via further instruction (i.e. catechism) and confirmation. Liturgical Acts and Conversion. McKnight also notes that in some liturgical traditions, such as the Catholic Church and the Orthodox Church, while conversion is experienced, the sacraments are more involved. Thus, baptism, the Eucharist and “official rites of passage” are where conversionary experiences often take place for “liturgical converts.”[xi] There is nothing to preclude that God can use such spiritual rites as touchstone experiences where metanoia (repentance) is combined with pistis (faith) in order to bring about epistophe (conversion). [i] Charles Kraft, Christian Conversion As A Dynamic Process,” International Christian Broadcasters Bulletin, [Colorado Springs, Colo.: International Christian Broadcasters, 1974], Second Quarter; Scot McKnight, Turning to Jesus: The Sociology of Conversion in the Gospels; Richard Peace, Conversion in the New Testament: Paul and the Twelve, 6; Peace, “Conflicting Understandings of Christian Conversion;” Lewis R. Rambo, Understanding Religious Conversion (New Haven, Conn.: Yale University Press, 1993). [ii] Scot McKnight, Turning to Jesus: The Sociology of Conversion in the Gospels. [iii] Richard Peace, Conversion in the New Testament: Paul and the Twelve, 6. [iv] Peace, “Conflicting Understandings of Christian Conversion,” 8-9. [v] Donald Miller’s analysis of the results of crusade evangelism in the Harvest Crusades with evangelist Greg Laurie discovered that only about 10 percent of the decisions for Christ resulted in long-term changes in personal behavior (Reinventing American Protestantism: Christianity in the new Millennium, Berkley: University of Calif. Press, 1997), 171-172. However, Sterling Huston’s earlier research on the Billy Graham Crusades suggested the results were six times this (Sterling W. Huston, Crusade Evangelism and the Local Church [Minneapolis, Minn.: World Wide Publishing, 1984]). Whether these discrepancies were the result of tactics, cultures, samples or eras remains to be researched. The answer may lie somewhere in between. The ambiguity of these results begs further analysis by researchers. [vi] Rambo, Understanding Religious Conversion, 165. [vii] Charles Kraft introduced terminology to distinguish the different types of people that experience sudden conversion or progressive conversion. On the on hand, Kraft saw people who undergo radical and sudden conversion as usually “first generation Christians” who previously had only been moderately influenced by Christian principles. On the other hand, Kraft saw “second-generation Christians” as those who were raised in Christian homes and in which “there may be little or no behavioral change evident as a result of the conscious decision to personally affirm one’s commitment to the Christian community in which one has been practicing since birth” (Charles Kraft, Christian Conversion As A Dynamic Process,” International Christian Broadcasters Bulletin, 8.) While the terms “first” and “second generation Christians” have been widely used, these terms cause some problems. First, Paul’s conversion was certainly radical and sudden (Acts 9), yet he had been practicing a devout lifestyle (Acts 23:6), so in Kraft’s paradigm he should have had a more progressive experience. In addition, McKnight’s story does not fit with Kraft’s paradigm, for in the interview that concludes this chapter McKnight states that he underwent a radical behavioral change in a progressive sequence. Thus, the value of Kraft’s insights may be that there are numerous ways that conversion is encountered and that whether a person is a first- or second-generation Christian has some, though limited, affect. Instead, the emphasis should be upon the fluid role of the Holy Spirit in individualizing conversion to each traveler, for as John 3:7 states, “So don’t be so surprised when I tell you that you have to be ‘born from above’—out of this world, so to speak. You know well enough how the wind blows this way and that. You hear it rustling through the trees, but you have no idea where it comes from or where it’s headed next. That’s the way it is with everyone ‘born from above’ by the wind of God, the Spirit of God” (The Message). [viii] Richard Peace, Conversion in the New Testament: Paul and the Twelve, 4. [ix] Ibid., 10. Some may argue that progressive conversion as described in Mark was necessitated because the Holy spirit had not yet been given at the Day of Pentecost. While this is a valid critique, Lewis Rambo’s research suggesting that most conversion is progressive (Rambo, Understanding Religious Conversion, 165) may indicate that both examples are valid. [x] Scot McKnight, Turning to Jesus: The Sociology of Conversion in the Gospels, 5.
by Norman G. Wilson, Wesley Seminary at Indiana Wesleyan University, 10/26/11. Frequently one may wonder if there is any way to make sense of the big picture and how these issues are interrelated. For these reasons, identifying and analyzing several overarching realities of North American Christianity that interface with a number of the most prominent issues could be very helpful for believers and churches. In this way, vital topics for discussion can be identified and addressed, hopefully leading to more comprehensive and faithful approaches to addressing the current challenges before us. A Mile Wide and an Inch Deep Abroad? On one hand, from various perspectives Christianity in North America is prospering. Protestantism, revivalism, the rise of evangelicalism, volunteering, and the modern missionary movement of the past century sensitized and mobilized the laity during the twentieth century to serve as missionaries in unprecedented numbers around the world. The financial resources available to North American Christians are at record levels. Furthermore, multiple mission organizations now provide administrative infrastructures for a broad spectrum of ministries and represent over a century of institutional memories and wisdom regarding effective management of missionary endeavors. These developments have contributed significantly to the huge global impact of the modern missionary movement during the past century and helped to establish Christianity in many countries around the world. Even then, at times and in many places around the world, rather shallow expressions of the Christian faith and doctrine were syncretized with local tribal customs, thus failing to penetrate deeply into the host cultures and thoroughly transform the people and their ways of life (cf. Cope 2001; Miller 2001; Sider 1999; Sider, Olson, and Unruh 2002; Stone 2004 and 2007). Meanwhile back home in North America, a number of debilitating weaknesses have emerged and are hindering North American Christians from fulfilling our Lord’s command. Worldliness is growing among many who call themselves Christians of the majority culture. Redemption and lift has created a Christian culture that is increasingly wealthy, materialistic, hedonistic, self-absorbed, parochial, and self-serving (Sider 2005). Furthermore, many who consider themselves Christians allow their perspectives and passions to be formed more by the influences of this world than by a personal relationship with Christ and immersion in the Scriptures. This growing tendency of North American Christians to identify more with the world and its values than with those of our Lord’s kingdom is weakening their ability to be effective witnesses of the Good News at home and abroad. Being an American and a missionary can have both positive and negative consequences. Americans around the world are both loved and hated, often for understandable and at times for puzzling reasons. The role of The United States as a world leader often represents a hindrance for Christian missionaries serving abroad. For this reason, discretion is urged regarding discussions about political matters. Otherwise, one’s motives and loyalties can be questioned, even when speaking from commendable perspectives. As a result, in many places one can never know for sure how those of our host countries are thinking and feeling about our presence and ministries. Due to the rise of fanaticism by those of Muslim backgrounds and otherwise, and also to North American nationalistic fervor and bellicosity, North American missionaries that live abroad are increasingly at risk. While being a Christian has always meant dying to self and living for Christ, the stakes for North American missionaries in many countries have never been higher. Obeying our Lord’s call frequently means considerable risks to a missionary’s personal safety and that of one’s family. Meanwhile, North American Christians back home need to remember that first and foremost we are citizens of our Lord’s kingdom and only pilgrims in our earthly country. The call in North America for local churches to be Missional, on one hand, could represent the possibility of a renewal of passion and interest and a welcomed shift of emphasis (Guder 1998; Rusaw and Swanson 2004; Stetzer and Putman 2006; Van Engen 1991). This new focus could motivate and enable local churches to reach outward and engage in transformational ministries in their communities, across the continent, and around the world. The call for local churches to become Missional could prompt one to hope for the coming of an exciting new missionary movement, bringing a breath of fresh air to North American missions, both domestically and globally. On the other hand, the proposal by some to “subsume missions in mission” (McClaren 2006, 138 ff.) could result in a reductionist approach to the Great Commission. One would hope that North American Christians could become effective as cross-cultural witnesses by first reaching the world that has come to our doorsteps in recent decades and then going around the world. But effective cross-cultural ministries typically do not happen automatically. Today more than ever, specialized training is needed to enhance our endeavors, often including years of missiological training and language learning (Medearis 2008, Pillai 2003). During the past century, missions organizations provided specialized resources, training, and infrastructures for cross-cultural ministries. Now with the emergence of the Missional church movement, some may imagine that local churches can fulfill the Great Commission both at home and abroad through their own initiatives and endeavors with little or no outside input or collaboration. Unfortunately, at times local churches end up focusing primarily on their own sub-cultures while minimalizing their cross-cultural Missional outreach efforts across town and around the world. Given that a significant number of evangelical churches today are located in rural, small town and middle and upper class suburban areas, many Christians of the majority culture rarely interact significantly with the diversity of cultures that are found in large urban areas. North American majority culture Christians typically have been slow to identify with strangers, the marginalized, visitors, and immigrants (Carroll 2008; Soerens and Hwang 2009; Wilson 2006 and 2009). For these reasons, local Missional churches need to supplement their endeavors through partnerships with broader ecclesiastical structures, mission organizations, churches in communities of diverse cultures, and other intermediary organizations for resourcing, training, and networking. New developments abroad represent emerging opportunities for North American Christians in Great Commission ministries. In recent decades the number of believers has multiplied in the Global south, providing a groundswell of coworkers in the harvest fields from Central and South America, Africa, and Asia, along with others from Europe, the Middle East, and the Pacific regions (Jenkins 2002, 2006, and 2007; Johnstone and Mandryk 2001; Mandryk 2009; Miller and Yamamori 2007; Noll 2009). These represent multiple opportunities to work together for greater Missional effectiveness. In response, North American believers must shift from their controlling paradigms of the past century, learn to work in multi-national teams, and enter into mutually submissive partnership relationships. A willingness to develop partnerships with non-North American workers is crucial in order to respond to the newly opened doors for ministry in previously closed countries and among peoples that increasingly are open to spiritual matters. Even where oppressive political regimes prohibit or severely restrict Christian witnessing, missionaries from other countries continue to go and faithfully serve the Lord. Our partnership with them can make a huge difference in their lives and ministries. God has blessed North American Christians with a wealth of resources, experiences, organizational structures, and insights, and we are called to give much in return for Christ and His Kingdom. Our greatest internal hindrances to Missional faithfulness are due to our own worldliness, materialism, hedonism, parochialism, and self-centeredness. Meanwhile opportunities to collaborate with Global Christians are greater than ever before in human history, representing huge opportunities for transformational ministries through cross-cultural partnerships and teamwork. Our effectiveness in these ministries depends in large part on our willingness and ability to cooperate as mutual partners. While the threats in many places also are greater than ever before, God has promised never to leave us nor forsake us. Furthermore, He commands us to go forth in courageous obedience to His call, confident in the knowledge that in Him we are more than victorious. Carroll R., M. Daniel. 2008. Christians at the border: Immigration, the Church, and the Bible. Grand Rapids: Baker Publishing Group. Clegg, Tom, and Warren Bird. 2001. Lost in America: How You and Your Church Can Impact the World Next Door. Loveland, Colorado. Cope, Landa L. 2001. “Biblical Reflections: The Old Testament (Part I) and The New Testament (Part II).” Messages presented at Godmission.community, Orlando. Engel, James F. 1996. Clouded Future: Advancing North American World Missions. Milwaukee: Christian Stewardship Association. Engel, James, and William Dyrness. 2000. Changing the mind of missions: Where have we gone wrong? Downers Grove: InterVarsity Press. Guder, Darrell L., Ed. 1998. Missional church: A vision for the sending of the church in North America. Grand Rapids: William B. Eerdman’s Publishing Company. Guthrie, Stan. 2000. Missions in the third millennium: 21 key trends for the 21st century. Waynesboro, Georgia: Paternoster Press. Jenkins, Philip. 2002. The next Christendom: The coming of global Christianity. Oxford: Oxford University Press. ________. 2006. The new faces of Christianity: Believing the Bible in the global south. New York: Oxford University Press. ________. 2007. God’s Continent: Christianity, Islam, and Europe’s Religious Crisis. Oxford: Oxford University Press. Johnstone, Patrick, and Jason Mandryk. 2001. Operation world: 21st century edition. Waynesboro, Georgia: Paternoster Lifestyle. McLaren, Brian D. 2006. The church on the other side: Exploring the radical future of the local congregation. Grand Rapids: Zondervan. Marty, Martin. 2007. The Christian world: A global history. New York: The Modern Library. Medearis, Carl. 2008. Muslims, Christians, and Jesus: Gaining understanding and building relationships. Minneapolis: Bethany House. Miller, Darrow L. 2001. Discipling nations: The power of truth to transform cultures (2nd Ed.). Seattle: YWAM Publishing. Miller, Donald E., and Tetsunao Yamamori. 2007. Global Pentecostalism: The new face of Christian social engagement. Berkeley and Los Angeles: University of California Press. Noll, Mark A. 2009. The new shape of world Christianity: How American experience reflects global faith. Downers Grove, Illinois: Intervarsity Press. Pillai, Rajendra. 2003. Reaching the world in our own backyard: A guide to building relationships with people of other faiths and cultures. Colorado Springs: WaterBrook Press. Pocock et al. 2005. The changing face of world missions: Engaging contemporary issues and trends. Grand Rapids: Baker Academic. Rusaw, Rick, and Eric Swanson. 2004. The externally focused church. Loveland, Colorado: Group Publishing. Sider, Ronald J. 1999. Good news and good works: A theology for the whole Gospel. Grand Rapids: Baker Books. ________. 2005. The scandal of the evangelical conscience: Why are Christians living just like the rest of the world? Grand Rapids: Baker Books. Sider, Ronald J., Olson, Philip N., and Unruh, Heidi Rolland. 2002. Churches that make a difference: Reaching your community with good news and good works. Grand Rapids: Baker Books. Soerens, Matthew, and Jenny Hwang. 2009. Welcoming the stranger: Justice, compassion and truth in the immigration debate. Downers Grove: Intervarsity Press. Stetzer, Ed, and David Putman. 2006. Breaking the Missional code: Your church can become a missionary in your community. Nashville, Tennessee: Broadman and Holman Publishers. Stone, Bryan P. 2004. Compassionate ministry: Theological foundations. Maryknoll, New York: Orbis Books. ________. 2007. Evangelism after Christendom: The theology and practice of Christian witness. Grand Rapids: Brazos Press. Van Engen, Charles. 1991. God’s missionary people: Rethinking the purpose of the local church. Grand Rapids: Baker Book House.